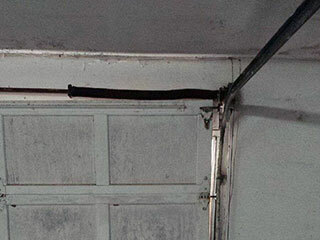 Your springs are extremely important parts of your overall garage door system. They are responsible for supporting the weight of your garage door as it lifts and lowers - they deliver a tension-based force via a stretching and contracting action, or torque (if torsion). Extension springs are installed in pairs, set up on both sides of the door; these springs stretch and the tension stored in their coils are used to lift and open the door. Torsion springs on the other hand are placed horizontally across a metal bar, right above the door. Typically only one torsion spring is necessary unless the door is bigger than standard. When the bar rotates, this action causes it to twist and lift the door. Due to the constant and extensive stress that these parts are under, they are prone to deterioration over time. In order to keep them in good condition, they require a certain amount of attention and care. This is why it's important to service springs on a regular basis; our technicians can ensure that your springs are well-lubricated and setup for quiet and steady operation. We can also adjust their tension levels to ensure they're not likely to become overstrained easily. We highly recommend homeowners avoid trying to handle springs themselves without professional help. When a spring breaks, the tension inside can get released abruptly, potentially causing it to whip around in a dangerous way. In addition, a spring that snaps suddenly can cause your garage door to slam down unpredictably, risking harm to anyone close by at the time. Whether you require an emergency spring replacement or require maintenance servicing to keep your components in good condition, you can depend on our experts at Garage Door Repair Waltham. Call us today for expert assistance!